Extra bed is possible in Suite Castle view for 500 CZK per day. Parking is available for 200 CZK per day. Pension Nostalgie in Cesky Krumlov is one of the smallest guest houses in the very center of historical part. Building from the 16th century was built between two neighbouring houses and offers beautiful views of Cesky Krumlov Castle. Over the time was this quiet residence housing the town butcher, than draper and later weavers, glazier and shoemaker. Extensive reconstruction has taken place in classical period and another reconstruction including renovation of original Renaissance facade was undertaken recently. Rooms were sensitively refurbished with an ancient antiquities and furniture. There are only 3 rooms in Pension Nostalgie. All rooms have very good accommodation standard, view of the Castle, free wi-fi connection, sat TV, table with chairs and private bathroom. 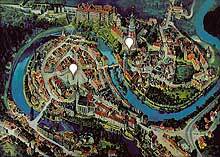 Clients of Cesky Krumlov Pension Nostalgie are kindly requested to advise aproximate time of arrival in advance. Parking is available for 200 CZK in Eggenberg brewery about 500 meters from Pension Nostalgie. Building from the beginning of 16th century has one floor and was built between two neighbouring houses. Vaulted ceilings are in the cellar. Renaissance facade was renovated recently. No other significant historical features. Over the time was this quiet residence housing of the town butchers, than draper and later weavers, glazier and shoemaker.